61,012 irregular migrants were officially registered by the authorities in the Western Balkan countries which is five times more than the 13,216 registered in the previous year. 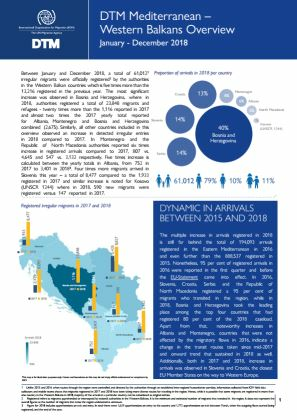 The most significant increase was observed in Bosnia and Herzegovina, where between January and December 2018 authorities registered a total of 23,848 migrants and refugees - twenty times more than the 1,116 reported in 2017 and almost two times the 2017 yearly total reported in all countries combined. Some 9,528 migrants and asylum seekers were residing ni different reception centers across the region.